Hundreds of other existing meteorite impact sites exist on earth, but the best preserved is the one in northern Arizona in America. The dimensions are astonishing: 1250 meters (4100 feet) wide and 172 meters (570 feet) deep. The impact of this solar system visitor was 150 times more powerful than the first atomic bomb explosion. The earth has been struck many more times by meteors than the crater-covered moon, yet has few impact scars because of rain, wind and other forces that erase geologic features. 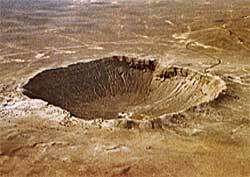 Yet, despite being 49,000 years old, Meteor Crater is in remarkable fine shape. Main reason: It lies in a very arid environment, which helps thwart erosion. Meteor Crater is so moonlike that astronauts trained inside for their lunar missions. Meteor Crater is not part of the state or national park system. It is privately owned and operated. The air-conditioned Learning Center on the north rim has two dozen educational exhibits and an 80-seat theatre showing a 10-minute introductory film. Outside, there are observation platforms and several high-powered telescopes that permanently point to objects of interest. The one-hour guided walking tour that skirts the northwest rim gives you a new perspective. In the summer, go on the morning's first tour to avoid the scorching midday heat of this high desert plateau.